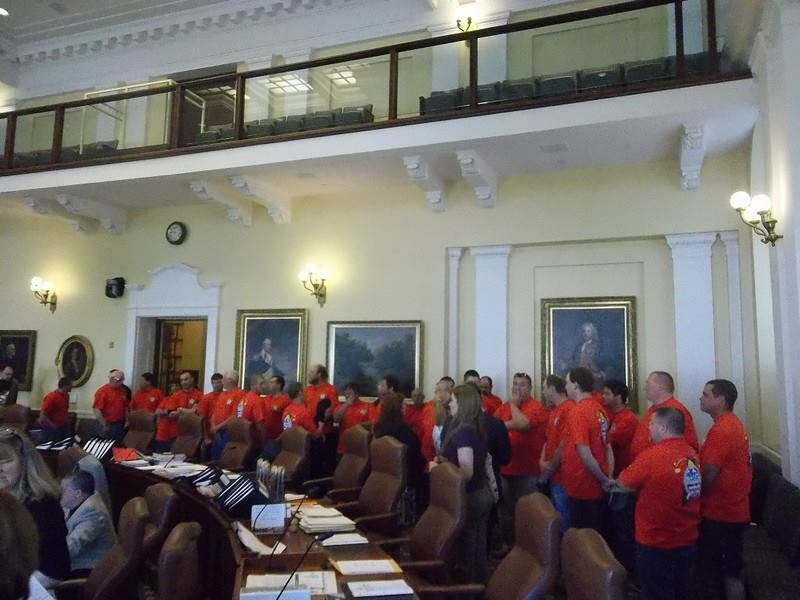 Members of the Maine Lobstering Union speaking with senators. Members of the Maine Lobster Union met with legislators last week to urge them to vote against LD 1549 “An Act To Provide an Exemption for Incidentally Caught Lobsters” and held a press conference in the Hall of Flags, making their case against the bill, put forth by Senator Anne Haskell (D-Cumberland). Originally intending to allow holders of a commercial fishing license who caught lobsters in their nets to possess and / or sell the accidentally caught crustaceans as is allowed in Massachusetts and under federal law, the bill instead placed those few remaining licensees in position to do what opponents called irreversible damage to the lobster industry and thousands of jobs as a whole, as the sustainability of the industry would be compromised by the taking of breeding stock and over-sized lobsters. 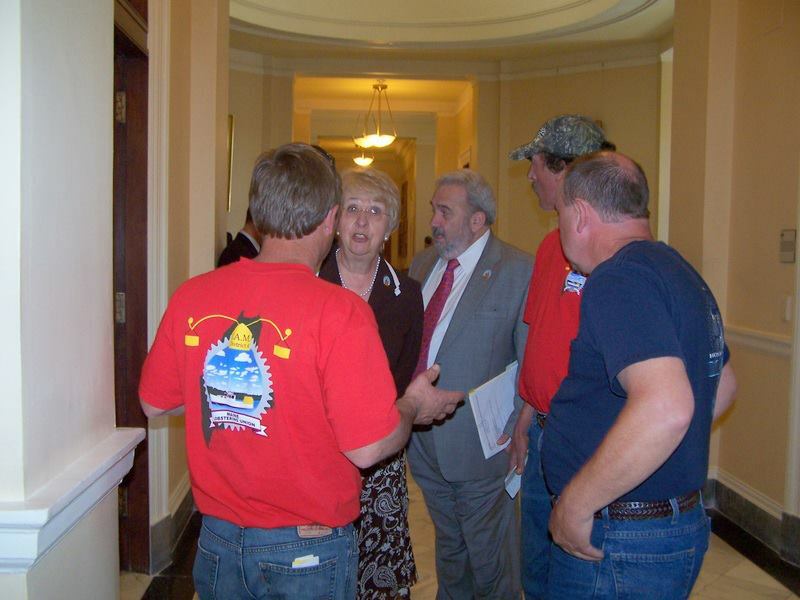 Senator Haskell is lobbied by members of Maine Lobstering Union. 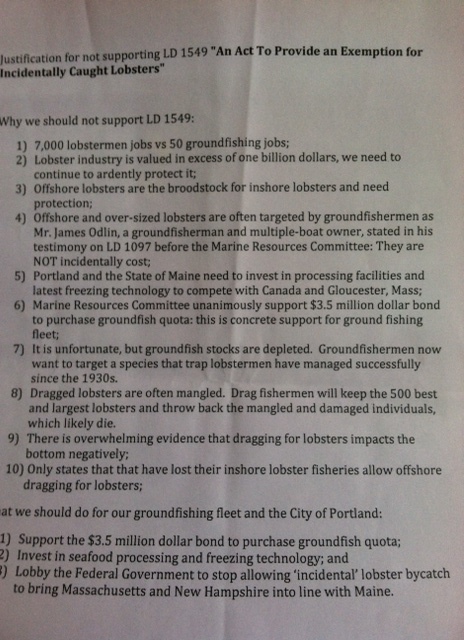 In the Senate floor debate, sponsor Anne Haskell acknowledged the concerns of the lobstermen, but also stated that as the practice is allowed in federal waters, that not one lobster would be saved by her colleagues voting against the bill. Members of the union disagreed. Ultimately the Legislature voted to kill the bill.